Enthusiastic, dynamic, creative, astute – EU alumnus Sebastian Gabor is all these and more. 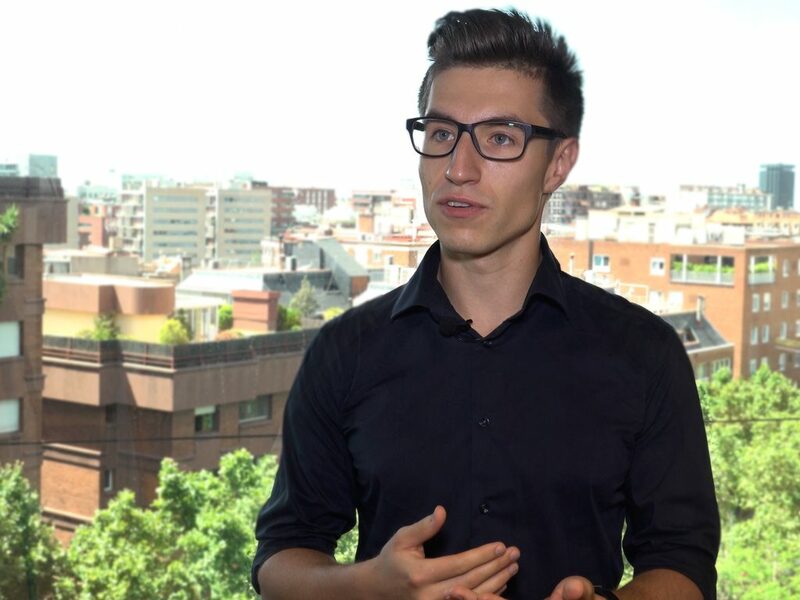 The young Romanian entrepreneur has already picked up an impressive amount of experience in the business world, hitting the ground running after graduating from EU with a BBA in wealth management. 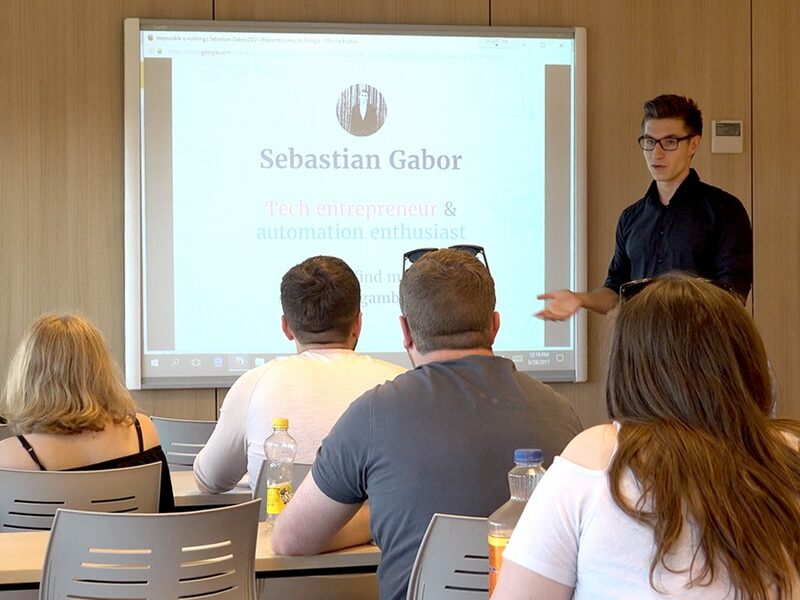 A founder of several startups and social initiatives, Gabor spoke to us about the complexities of creating and running a business, and how overcoming the difficulties made him re-evaluate what really matters in life. To be honest, I didn’t know exactly what I wanted to do after graduation. So I went home for a couple of months. Then, because of opportunities that came up, due to EU actually, I started a business in tech. What I’d learned at EU helped me a lot in creating the business. I took all the business principles that I learned, which were really useful. I found that throughout the years I was learning new things, but everything had the foundation of what I learned at EU. In Romania, we don’t have such international diversity. So, coming to EU, it was the first time I actually met people from places such as Africa, Asia, from the States, from Europe. This international environment helped me learn about these cultures. When you learn about a new culture, new opportunities arise. This has helped me form ideas and get a better understanding. Also, I’ve made a lot of new friends. From what I’ve learned so far, having perseverance, being extremely social and being empathic – understanding people’s needs – are key qualities. When I started, I was a bit naïve in thinking that life was going to change radically. Once you start working on your own business, you have the advantage that you can do what you really believe in; but in fact there’s a lot of responsibility that comes with it, a lot of stress. All your employers rely on you and sometimes you have to take hard decisions that, even after business school, you aren’t prepared for. This is something you need to learn yourself, at the right moment. Besides that, being an entrepreneur really changed my life and I would never go back. Code for Romania is an NGO that I co-founded together with six amazing people in Romania that basically creates a community of developers. We talk with a lot of NGOs and other governmental institutions. We understand their needs and create project specifications and work together with them for the community. This allows us to solve a lot of societal problems and to create a lot of open-source code that other countries can use. When I started I really thought that the only purpose was money. That money makes you happy. But once you actually start making money and you see that you don’t need more than a certain level, other things motivate you to do what you do. If you’d have told me this when I started, I wouldn’t have believed it. But I think, when you have enough money to live, you don’t worry anymore about the money part. You really seek motivation to see how you can help the world, how you can leave a mark upon the next generation. It’s important to overcome things and not give up. I remember when I started, it was the first month and we had four employees. We were waiting for payments from the clients, the contracts were signed. The end of the month was coming and there was no money in the bank. It was my responsibility to say to the team “Yes, I disappointed you and what I promised can’t be achieved.” I normally sleep like a log. That night I couldn’t sleep. I was thinking, if this is the stress I need to undergo to achieve “my dreams”, then it’s simply not possible. There needed to be a change in the way I perceived stress and the way I perceived failure. I promised myself I would never get to another situation like this. Luckily, afterwards, the employees understood. The next day I started shifting my mentality and from then onwards, everything started going much better. A young, ethical businessman, with the world at his feet. To find out about our bachelor’s and master’s programs, click here.